Just as each person is unique, irrepeatable and irreplaceable, it follows that each Saint is unique in their own personalities, characteristics and especially in their spirituality. Gemma normally spoke very little, unless engaged in spiritual conversation, and usually kept her eyes cast downwards. She shied away from worldly conversation as much as possible. She preferred the most humblest of household tasks, especially mending the clothes of the large Giannini family (the family who took her in) and caring for the family members and servants when they were sick. She also frequently took care of the younger Giannini children in all their daily needs. She was always docile and obedient to others. Her free time was primarily spent in quiet prayer and reflection. In her writings we find that in her prayer life she frequently meditated on the Passion of Jesus, and all the pain that He suffered in reparation for sin. She often wrote about how much Jesus suffered for our sins, and with the Passion of Jesus always in mind, she often expressed her great sorrow and repentance for her own sins. (see for example the quote at the bottom of this page -editor) . For this reason she is called the "Passion Flower". She made a Holy Hour in honor of the Passion of Jesus, every Thursday night from 11pm to midnight (*see note at bottom). She preferred conversing with God throughout the day in natural conversation, that is informal prayer, rather than in formal, vocal prayers, however she usually did take part in the nightly family rosary, said in the Giannini home. Even while occupied in daily tasks, she normally kept herself "in the presence of God", as she humbly states in her diary. When possible, she would endeavor to do some spiritual reading. She read and re-read with much interest and fervor the Life of Brother Gabriel Possenti C.P. , of he whom later appeared to her in several visions and whom interceded and obtained a miraculous cure on her behalf. The most important thing to Saint Gemma was her daily meeting with Jesus in the Holy Sacrifice of the Mass. Recieving Jesus in Holy Communion was the source and summit of her daily spiritual life. 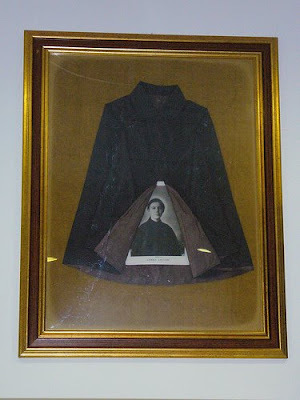 Regarding Gemma's simplicity of dress, Bishop Proserpio writes in his book "St Gemma Galgani" -"The simplicity of her dress was well known. Lucca [Italy] shall always remember Gemma's "mantellette", under which she invariably kept her hands when going out of the house, oftentimes to hide the stigmata. 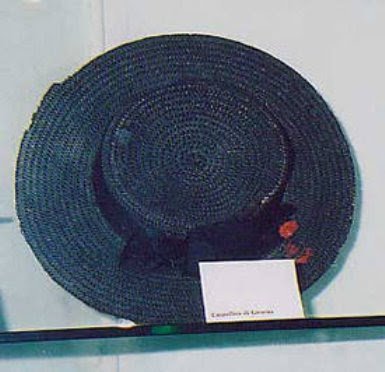 Her hat (black colored straw hat -editor) ...had become an object of numerous comments from other maidens of the town. Mr. Matteo, the patriarch of the Giannini family, confessed that he was, at times, ashamed to go out of the house in Gemma's company, because as he put it "she was so ridiculously dressed". And yet, Gemma was noted for the simplicity of her dress and comportment. She was not really ridiculous in her way of dressing, but she did not want to wear the fashionable clothes of the girls of her age. Whenever such clothes were presented to her, she would find a way of exchanging them for older ones, or she passed them onto the poor." Gemma wore this simple black "mantellette" whenever she went out of the house. Once she was invited to a relatives wedding, and the Bride to be, upon seeing Gemma in her simple black straw hat and mantellette said loudly for all to hear "What is the matter with her? What is she doing here dressed like that?" In his "Life of St Gemma", Father Germanus states "Her dress was most simple. It consisted of a black woolen material, and a black straw hat....In vain her friends protested. This was the only way he dressed, winter or summer". ‘I ought to have written sooner but I am sure that you will excuse my negligence. In the name of my aunts, then, I wish you great happiness; all of us will pray to Jesus that He may pre­serve you for long years in the affections of Guido and for the greater good of the family . . . Before ending I want to tell you something. From the moment of your marriage I have had this thought constantly; Papa was so pleased that you two were to be married. If only he had been there! Then afterwards I realized that all my adversities have made me resigned to the Will of God. Her brother Guido and his wife later visited Gemma, and Gemma having the stigmata, was obliged to wear gloves even at table, where she was subjected to some good-natured banter from her unsuspecting brother: "How stylish, eating with gloves on!" His wife seems to have taken for granted that Gemma was protecting a bad case of chapped hands and, after dinner, drew her aside and said: "I have some rose water and I will bathe your hands." And not waiting for Gemma's consent, she stripped off the gloves, and recognising the wounds ran weeping to Aunt Elisa: "Oh Aunt, why didn't you tell me! Gemma has wounds on her hands just like Our Lord's!" Perhaps the young bride finally got around to the reading of the little book which Gemma brought to her as a present on her wedding day: “The Introduction to a Devout Life” by St. Francis de Sales. If so, Assunta then realized that one with nails through the palms can neither grasp nor hold anything else on this earth. Gemma had sold all to gain a Pearl of great price, a Treasure of infinite worth. And Jesus kept her strictly to the bargain. "To see her", her companion [Cecilia] writes, "she seemed each morning as if she were getting herself ready for her nuptials, or as she herself put it '-to go to the feast of the love of Jesus". In her Autobiography she writes: “I recall very well one time I was given a gold watch and chain. Ambitious as I was, I could hardly wait to put it on and go out (an indication, dear Father that my imagination was working on me). I did in fact go out with it on and when I returned home and started to take it off I saw an angel (whom I recognized immediately as my Guardian Angel) who said to me very seriously; “Remember that the precious jewelry that adorns the spouse of the Crucified King can only be thorns and the cross.” I did not even tell my confessor about this. In fact, I tell it now for the first time. These words made me fear, as did the angel himself. But a little later, while reflecting on them without understanding them at all, I made this resolution: I resolve for the love of Jesus, and to please Him, never to wear the watch again, and not even to speak of things that savor of vanity. At the time I also had a ring on my finger. I took it off immediately and from then until now I have not worn such things." Sandrina Maggi (an acquaintance of Gemma) tells this anecdote "One evening I was walking with Gemma along the Via del Vado when we met a old Lady who was shivering from the cold, due to a lack of proper clothing. Gemma had just received from one of her Aunts a heavy woolen undergarment. Quietly she withdrew behind a door, removed the undergarment and gave it to the lady saying 'Pray for me that Jesus may warm me with the fire of His love' ". Another notable characteristic of St Gemma was her strong reaction to blasphemy. Here again Bishop Proserpio writes "One of her brothers occasionally broke into blasphemies. For a soul penetrated with the profoundest reverence for the Holy Name, the mere thought of such a thing was unbearable. Gemma, who with selfless love always endeavored to cover up the faults of others, began to cry and replied 'It is because of the blasphemies of my brother'. 'And the blasphemies caused the blood' her aunt asked. 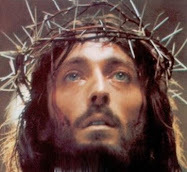 'Yes, I saw Jesus suffering so much when blasphemed, that I suffered with Him, and my heart poured out blood'. Aunt Elisa calmed a little and said 'Is it only your brothers blasphemies that cause this blood, or those of other people too?' 'I suffer always' replied Gemma, 'but when it is he that blasphemes, I suffer much more'. 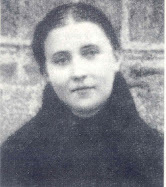 Along with sweating blood, Venerable Father Germanus documents in his book "The Life of St Gemma Galgani" that on at least one occasion, Gemma immediately fainted upon hearing someone curse the name of God. In his book "St Gemma Galgani" the Bishop of Calcutta, Rev Dr. Leo Proserpio S.J. writes "One cannot help being lost in admiration at the ways of the Saints. 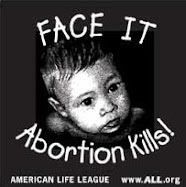 If we cannot tread the same heights, let us at least humble ourselves." Gemma was also very cautious in her manner of speaking, especially in speaking of others. Her spiritual director, Father Germanus states- "She would never speak ill of anyone." "You would need a wrench" said a witness "to draw a word from her regarding others, even when the information was necessary or useful, if that word had to be one unfavorable to them." 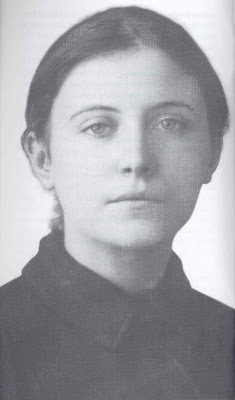 The information in this article is from the books "St Gemma Galgani" , by Right Rev Dr. Leo Proserpio S.J., Bishop of Calcutta, and also "The Life of St Gemma Galgani" by Venerable Father Germanus C.P. I too am very thankful to Mr Brown of Spirit Daily for highlighting the website, that many people may come to know of all the glorious things that God has wrought through His servant, St Gemma. Her name is pronounced "gem" as in a precious gem (gemstone). Unfortunately I don't know of any specific symbol for St Gemma. I will say that she is often pictured in holy cards and medals holding lilies (because of her angelic purity, and her emphasis on purity during her lifetime) and she is often referred to as the "Lily of Lucca"---in fact, there are a couple of different books written about her under this title. I hope this helps. Best wishes and may God bless you and your loved ones. Thank you Mr.Glenn Dallaire for this article. 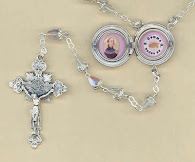 I hope Jesus Christ wishes to give us graces from the huge deposit He has given St. Gemma. I believe that it is the work of Our Lord that people are at this webpage.